Choosing a college. Flunking out. Facing punishment. Learning to learn. Embracing a mission. Wrestling with doubt. Helping a friend. Hitting bottom. Hearing the call. Struggling with finances. Stressing over finals. Confronting prejudice. Changing majors. Grieving over loved ones. Falling in love. Dealing with defeat. Picking up the pieces. Accepting grace. Losing hope. Finding Jesus. An outstanding roster of college and university administrators and professors, along with other Christian thought leaders, share moving and instructive personal stories of how God led them while they themselves were students in higher education. With first-person testimonies by Darrell L. Bock, Kenneth S. Hemphill, John C. Ortberg, Jr., Luis Palau, H. Norman Wright . 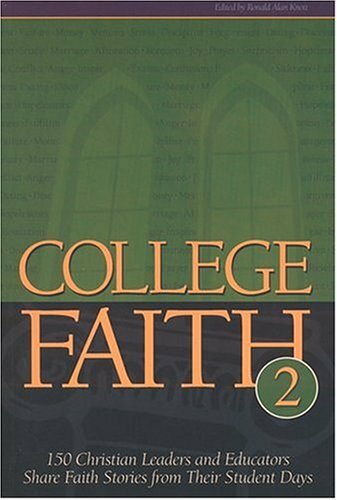 . . and 145 more written by administrators and professors from more than 100 Christian colleges, universities and seminaries, including . . . Asbury College, Azusa Pacific University, Baylor University, Calvin College, Cedarville University, Dallas Baptist University, Indiana Wesleyan University, Loma Linda University, Oral Roberts University, Oakwood College, Seattle Pacific University, Spring Arbor University, Trinity International University, Union University, Wheaton College.